Helping children is why she decided to run for Oregon’s first Kid Governor. Miller and Cameron Vandecoevering, both fifth graders at Forest Ridge Elementary, were selected as two of eight finalists. 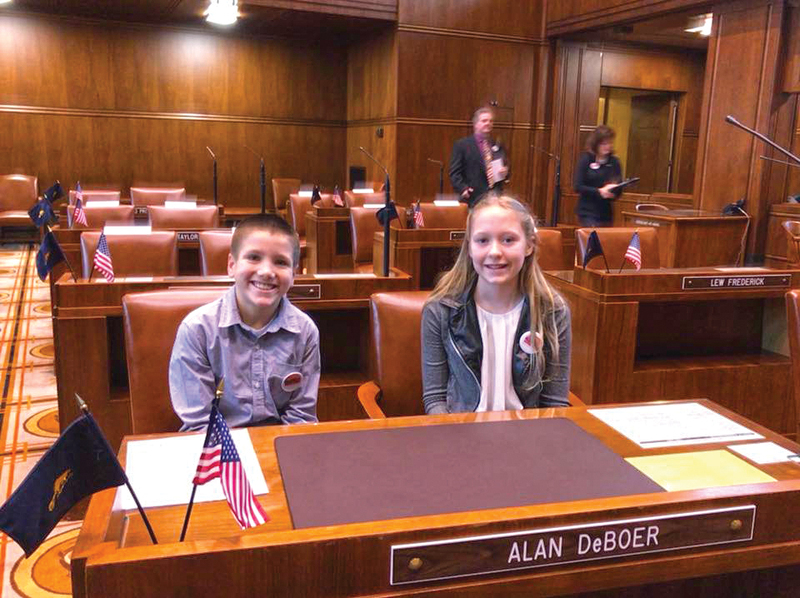 After an election, which included votes from more than 1,300 fifth graders from across the state, Dom Peters, of Willamette Valley Christian School in Brooks, was named the winner. Miller and Vandecoevering attended his inauguration at the state capitol on Jan. 8, which included a invocation, live rendition of the national anthem and a presentation of the colors by a local Boy Scouts. Oregon is the second state to implement the program, which began in Connecticut in 2015. In Oregon, 83 classrooms representing 54 schools participated. The process began with five in-class civics lessons about Oregon’s three branches of government, the role of the governor and how and why elections are held. Each candidate made a 1-3 minute video, introducing themselves and stating their platform. Twenty-one videos were submitted. Jonathan Shay, video production instructor at the Career Technical Education Center in Salem, assisted the Forest Ridge students with their videos. Miller wanted to help kids in foster care. She then listed three simple steps to help with the issue: find support because nobody can tackle the problem alone; ask local foster homes what supplies they need and hold a supplies drive; and put together and deliver care packages. “I wanted the opportunity to be able to help with issues that are in our community because kids don’t get much of an opportunity to help with big problems,” Miller said. Vandecoevering, whose father is a firefighter in Hillsboro, chose emergency preparedness for his platform. “If I am elected as your kid governor I will make it my mission that all homes and families are educated and prepared for any emergency,” Vandecoevering said. His three-point plan was having a smoke detector in every room, an escape plan in case of an emergency and at least one fire extinguisher in the home. Thomas Charboneau, principal at Forest Ridge, was proud of both Miller and Vandecoevering as well as all of his students that applied for the Kid Governor program.